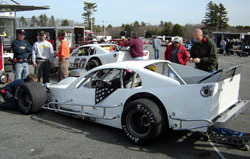 The snow has finally melted and for the first time in 2005, race engines have fired up at a short track in New England. Thompson International Speedway (CT) hosted a day of open practice on Thursday for their weekly competitors, as well as the teams of the NASCAR Whelen Modified Tour. Stefanik wasn’t quite as happy with the handling of his car, but he’s not too worried considering the relationship that he already has with his new team. More than a dozen Modified Tour teams took advantage of the practice session including those of Ted Christopher, Chuck Hossfeld, Donny Lia and Mike Stefanik. All of the teams at the track had different objectives when it came to the day. Some teams wanted to try out the new toys that they acquired over the in winter. In Donny Lia’s case, that was a new Troyer car with a fresh new body on it. Other camps in the garage were working on the chemistry that needs to be established between a new driver and team combination. 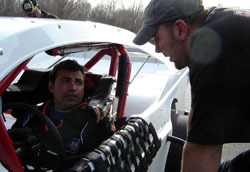 Chuck Hossfeld drove the #50 Don Barker-owned Ford Mustang for the first time, while Mike Stefanik was in attendance with the Joe Brady-owned #00 team. Another important part of the test was to evaluate the new Hoosier tire that Tour teams are running in 2005. Ted Christopher was a critic of the tires used last season, but thinks that the rubber for this year has a lot of promise. Donny Lia had a new car at the test (Top) and here he discussses one of his runs with spotter Brian Crowley (Bottom). Absent from the test were the teams of Ken Barry, Eric Beers, Mike Christopher, Doug Coby, Eddie Flemke, (who was at the track helping out a few customers of his Raceworks chassis building business), Rick Fuller, Tony Hirschman and Jerry Marquis. Some of these competitors might have chosen to practice during a session on Saturday, but that was cancelled due to heavy rain. This weekend, Christopher and Lia will both be far from the Connecticut oval. Both drivers are entered in the NASCAR Whelen Southern Modified Tour race at Ace Speedway (NC) on Saturday. The Icebreaker at Thompson will kick off on April 9th-10th and Speed51.com will have extensive team coverage of the event coming up. But Christopher thinks that a good test can lead to momentum and there is no shortage of that in his camp after winning both the Florida Speedweeks championship and the NASCAR Whelen Southern Modified Tour opener at Caraway Speedway (NC). Both accomplishments came before most drivers even saw a racetrack in 2005. Renee Dupuis' #90 car was at Thompson. when you have someone like me who wants to race real hard every lap." Another reason for the test was something very simple, but also very important. There are different opinions on how much actual knowledge that a team can gain when it comes to actually preparing for next weekend’s race though.